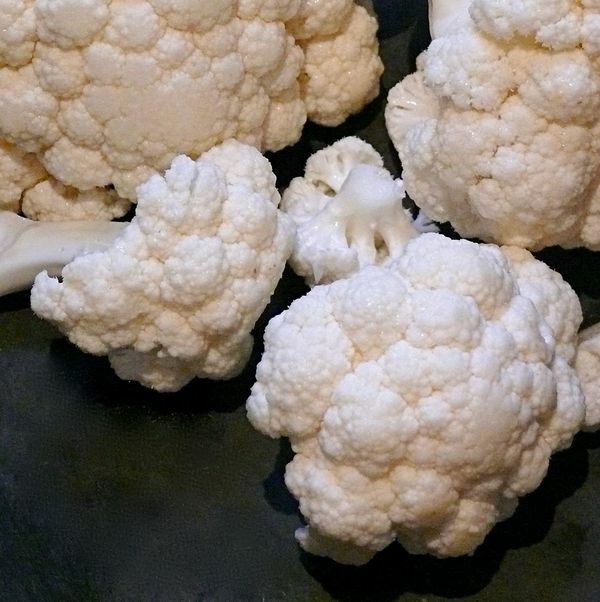 When I think of cauliflower, I think of aloo gobi, the dish that everyone I ever go to Indian restaurants with wants to order. Chop your cauliflower into small florets and a russet potato into similarly-sized pieces. Add them to a blend of browned aromatics and toasted spices: minced onion, serrano chili(es), garlic, ginger, ground coriander and turmeric, cumin and mustard seeds. Add some water, salt and simmer until the vegetables are cooked, then serve over rice. Making a cauliflower soup is as simple as simmering it in broth and pureeing it when it’s done, but roasting it, along with leeks or onions and garlic first will make your soup more complex and delicious. You can also sweeten your soup by adding roasted pears or apples, and thicken it by adding potatoes if you wish. Simply hold back the liquid if you want to your soup to be a flavourful cauliflower puree instead. It could be a side, sure, or treat it like a pesto and use it to coat pasta, as a healthy dip for other vegetables or fritters, or a hardy spread for pitas and sandwiches. Depending on your recipe, you can par-cook cauliflower, by steaming, boiling or roasting it, to get it to a certain doneness and speed up your active cooking time. But don’t forget about frying it as a once-in-a-while indulgence. It’s one of those vegetables with lower water content, so you could shallow or deep-fry florets to transform them into your new, favourite, crispy, totally-dip-able snack. Cauliflower may not be liked by many people. but is has many helpful ingredients for body.